I'm wondering where one would go to find one for an MSD....? I don't know of any companies that make them in that size. 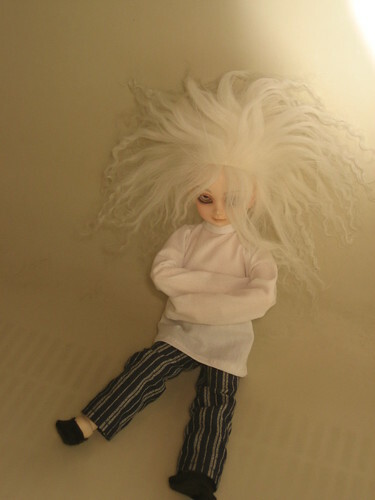 I do know that the living dead doll straightjackets fit bambicrony dolls..they wouldn't fit msd size though..too big for yo-sd even..
Onegreyelephant made some before but I think they've all sold out. Maybe put a WTB in the marketplace? my girlfriend made one for my little guy (fantasydoll glen) (here's the front and here's the back) and she takes comissions, her name is Unseelie Queen on the forum. I've actually thought about making one myself, but seeing as I can't even get a simple skirt to turn out, I'm still quite a ways from trying a complicated shirt like a straight jacket. Hopefully, I'll get better at the sewing, then I can try my hand at it. I was wondering if anyone else was interested in straight jackets for MSD's, neat to find out there are. I bought mine from doa some years ago now, it was a fantastically authentic strait jacket with buckles complete with hospital pyjamas and slippers you can find pictures of it on my Limho in the gallery somewhere...i think there definitely needs to be someone who makes them on doa again if there isnt already to the standard they were made, i think alot of people would be interested in them! maybe start a gallery thread of dolls in strait jackets to see all the different styles? You could modify a simple shirt or jacket pattern. Extend the sleeves and add straps and little buckle. I referenced a real (and once used!) vintage straight jacket my sister's boyfriend bought, to make mine. Just use a plain shirt pattern and put the opening in the back, close it with little belts. The sleeves are long and closed on the ends, covering the hands. A strap should come out from each 'glove' bottom. And you need to put 1-2 straps down the front of the shirt; hte arms cross through the straps, across the chest, and tie in the back. wow, and now I know! i got something from Dollmore that really looks like a straight jacket! it doesn't have the buckles or anything but you could sew those on and make it good. 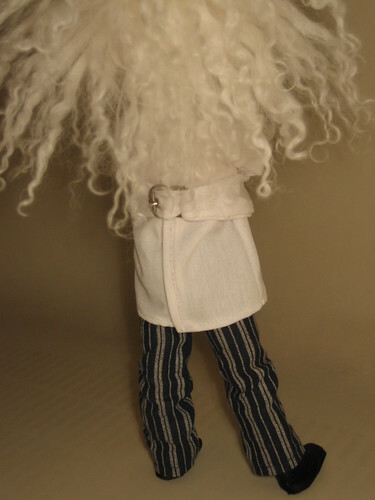 Here is the link and here is a pic of my doll in it. it's not the best pic but it shows that you can tie it in the back and you can even cross his arms over his chest and tie it in the back around his neck . . .
She only likes living dead dolls and the Edward Scissorhands doll I got her!